Proper observance of etiquette is as much a part of your training as is learning techniques. In many cases observing proper etiquette requires one to set aside one’s pride or comfort. Standards of etiquette may vary from one dojo or organisations, but the following guidelines are nearly universal. Please take matters of etiquette seriously. When entering or leaving the dojo, it is proper to bow in the direction of the kamiza, or the front of the dojo. You should also bow when entering or leaving the mat. Be on time for class. Students should be lined up and seated in seiza approximately 3-5 minutes before the official start of class. 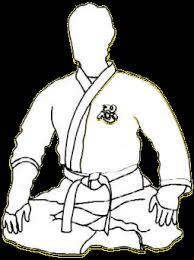 If you do happen to arrive late, sit quietly in seiza on the edge of the mat until the instructor grants permission to join practice. Remove watches, rings and other jewellery before practice as they may catch your partner’s hair, skin, or clothing and cause injury to oneself or one’s partner. Do not bring food, sweets, or drinks onto the mat. It is also considered disrespectful in a traditional dojo to bring open food or drink into the dojo. Please keep talking during class to a minimum. What conversation there is should be restricted to one topic – the martial art you are being taught. It is particularly impolite to talk while the instructor is addressing the class. If you are having trouble with a technique, do not shout across the room for help. First, try to figure the technique out by watching others. Effective observation is a skill you should strive to develop as well as any other in your training. If you still have trouble, approach the instructor at a convenient moment and ask for help. Please keep your fingernails (and especially one’s toenails) clean and cut short. Please pay your membership fees promptly. If, for any reason, you are unable to pay on time, talk with the person in charge of collecting the fees. Sometimes special rates are available for those experiencing financial hardship. Change your clothes only in designated areas (not on the mat!). It is considered polite to bow upon receiving assistance from the instructor.